What does your company do best? Or better yet, what can your company potentially do better than any other company? And perhaps just as important, what can it not do best? According to Jim Collins, author of Good to Great, answers to these simple questions offer insight into your firm's purpose. And, if answered with brutal honesty, they are key to moving your company to greatness. Why? Because this is your competitive advantage. Specifically, it is your company's unique skills and resources working to implement strategies that competitors cannot implement as effectively. Understanding your competitive advantage is critical. It is the reason you are in business. It is what you do best that draws customers to buy your product/service instead of your competitor's. Extremely successful companies deliberately make choices to be unique and different in activities that they are really, really good at and they focus all of their energy in these areas. Of course once you have identified your competitive advantage(s), you're not done. It is not enough just to have an advantage over your competitors. For your business to be great, it needs to weather competitive and environmental storms. You have to be able to combat today's fierce market forces and uncertainty. In other words, your competitive advantage needs to be sustainable and able to endure the test of time for your company to be great. Why? Because most advantages can be duplicated within a period of time. Here are the hard and cold facts: Roughly 70 percent of all new products can be duplicated within one year and 60 to 90 percent of process improvement (learning) eventually diffuses to competitors. And everyone knows competing on price is never sustainable. 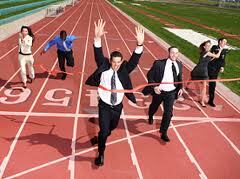 So, what is your firm's competitive advantage? Do you have one? And if you do, are you focusing on it? Here's a quick way to check your pulse. Do any of these statements sound familiar? "We're better than they are. They'll never do __________ as well as we do." "Our competitors are too big and slow. They'll never respond quickly." "All we need is one big contract." "We'll have first-mover advantage. We'll lock our customers in before our competitors know what is happening." "No one knows our customer like we do." "My competitors are too stupid. Our team is much more innovative." "If the big guys buy our product, we're home free." "We're it. There is no one else in our market who does what we do." Summing it up is Michael Porter, the Harvard competitive advantage guru. Mr. Porter states, "It is incredibly arrogant for a company to believe that it can deliver the same sort of product/service that its rivals do and actually do better for very long. It is extremely dangerous to bet on the incompetence of your competitors". If any of these statements do sound familiar or if you are banking on the general incompetence of your competitors, it's time to get serious about the purpose of your company. First, assess what your company does best by looking at what you are good at and what you are not good at. Turn it into a competitive advantage by focusing your energy on these activities. Lastly, make it something that will endure by continually developing and working at it. Customers must see a consistent difference between your product/service and those of your competitor's. This difference needs to be obvious to your customers and it must influence their purchasing decision. Example: Coke vs. Pepsi. Your competitive advantage must be difficult to imitate. Avoid falling into the incompetence trap. Example: IN-N-OUT Burger vs. McDonalds. The above two items combined must be activities that can be constantly improved, nurtured, and work at to maintain that edge over your competition. Ex: Wal-Mart vs. Kmart. Before you put this article down, ask yourself: What is my competitive advantage? And is it sustainable? Your company depends on it.